Konami producer Dave Cox has spoken to ONM about the forthcoming Castlevania: Lords of Shadow — Mirror of Fate, and as usual, the term "Metroidvania" has once again reared its ugly head. Cox has stated several times that the new 3DS title won't follow in the footsteps of Symphony of the Night, Dawn of Sorrow and Portrait of Ruin, but instead will be more focused on combat. However, Cox did admit that the game would have a stronger focus on exploration than Lords of Shadow did on the 360 and PS3 — something which could make it feel more akin to the Metrovania-style titles than the traditional linear games, like Super Castlevania IV. "We listened to feedback from the audience about what they did and didn't love about Lords Of Shadow. It's fair to say that exploration will play a bigger part in Mirror Of Fate. The game is still a combat action-adventure game, but we felt that was an area we could develop further to make it more interesting for players and give them more of a world. So in Lords Of Shadow, 90 per cent of the game takes place in the castle, the map is very reminiscent of the Metroidvania style of games. We're not trying to recreate a Metroidvania style game; what we're trying to do is expand exploration beyond the old linear style." Sounds good to me. The screenshots are not half bad either. I already accepted a long time ago that this won't be another one of my beloved Metroidvanias. Now I'm more hoping that it'll play like something of a hybrid between the three main styles of Castlevania. This series contributed to half of that genre name anyway. Let it do as it wishes. You cant criticise a Castlevania game for being in a genre it helped create, or by changing it up a little either. While I love metroidvaina the series def needed a rest from the formula after all the Iga games. In the meanwhile there are a ton of other metroidvaina ln other consoles. I take that back it may be disapointing that its not metroidvaina but more than likely i will enjoy this new action type stuff, i will still buy it cause i buy everything castlevania and/or final fantasy( its like my duty i guess). I love action platformers anyway so.. I can't wait now! I like the Metroidvania style, but I enjoy the linearity of Super Castlevania IV more. The graphics look great and gameplay looks good! And from what I have heard of castlevania music you can usually count on it being good. ANNOUCE A RELEASE DATE ALREADY! THERE IS NOTHING WRONG WITH "METROIDVANIA" in fact, it's a for-sure-win, duh. Super Metroid and SOTN are two of the best games ever. The DS series of Castlevanias are some of the only ones that live up to SOTN in any way at all. Lords of Shadow was probably the only castlevania on a console that was actually awesome and really worth playing (Curse of Darkness was okay). I think we should all wait and try it, then judge. Even if its not 100% what everyone expects from castlevania, if its a "god of war" with exploration I definitely will give it a try! All I need to hear is Metroidvania. The odds of me getting this game have greatly increased. Personally I've never given a damn about the 'Vania' part of Metroidvania. @RevolverLink What are the 3 main types of gameplay? I'm just curious, I don't know too much about Castlevania, haha. Pass on this "Castlevania". at this point Epic Mickey Power of Illusion will be more of a Castlevania game then Mirror of Fate. Just give me old school Castlevania. @SuperMinusWorld - Right now? I'd say Classic-style (the games from the 8- and 16-bit eras, they were largely, but not always, pretty linear side-scrollers, with a greater focus on careful timing and using the whip and various sub-weapons for combat), Symphony of the Night-/Metroidvania-style (still side-scrolling, they're sort of a fusion of "Classic" with very prominent Metroid-style non-linear exploration and RPG elements) and, most recently, the rather polarising Lords of Shadow-style (very much in the vein of modern 3D action games like God of War, to borrow a very common comparison) are the three main "schools" of Castlevania design. Of course, there are also some entries that don't fit as neatly into one category as other games (Castlevania II had quite a bit of Metroidvania in its DNA long before there was such a thing as Metroidvania, Order of Ecclesia's first half could be seen as something of a bridge between the first two gameplay styles and Mirror of Fate is, preumably, attempting to mix in some of everything) as well as previous forays into 3D that failed to stick, but those are the three that have been successful for Konami. Couldn't care less for this GodOfWarVania 2D westernized bogusness.Even if it were a straight up metroidVania sequal developed by Konami Japan i wouldn't be too thrilled with it either. I'm burnt out on MetroidVania, SOTN and DOS were enough for me, i can't see myself going through another or wanting to waste my time doing it all over again. I just want another traditional Castlevania game.....Developed by WayForward just imagine...They nailed it with Contra 4. I better cherrish the time spent with Bloodlines and The Adventure seeing as how those are the only 2 traditional Castlevania games i have left to play. After that, looks like the traditional franchise will be dead for quite a while...I've been really annoyed with Konami as of late, outsourcing all of their killer franchises to western developers. Castlevania and Silent Hill have been hit on the head by a FrankenSledgeHammer. Put a stake in Metroidvania. SCIV and Rondo are where it's at. The thought of returning more to the series' roots before all Castlevanias were Metroidvanias has me slightly more interested. Remembering that this is still based on God of War clone Castlevania, I'll still have to wait and see, however. I don't mind if they made future Castlevanias in the way of the past GBA and DS entries. But if they really want to return to those kind of games, they got to wake it up so it still feels fresh instead of giving gamers the "been there, done that" feeling. It irks me how deadlocked people's views on the Metroidvania term are. 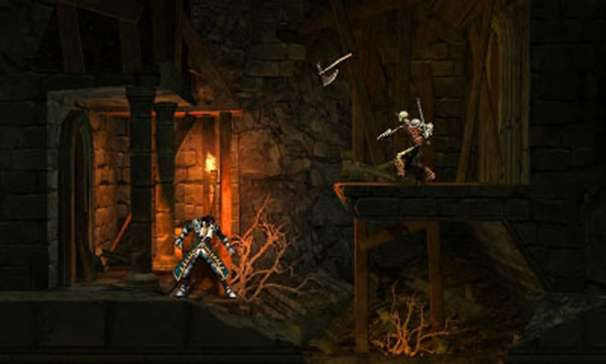 Neither the early Castlevania's nor any of the Metroid games had RPG-elements and different weapons. Personally i very much adore the variety Samus' upgrades bring. So why not have a Castlevania that "only" takes a huge leaf out of Metroid's exploration and atmosphere? I'd really love to see that.